Pi Lambda Phi at the University of Florida has caught lightning in a bottle! We must harness that power to ensure it sustains our Beloved Chapter for generations to come! This email intends to update the Alumni base with a synopsis of the events of Spring/Summer/Fall 2015 and rally support and attendance for NOSEBOWL 2015! Over the past decade Pi Lambda Phi re-established itself as a medium sized solid fraternity of 60 Brothers at the University of Florida. Aspiring to be more than solid, Brothers, Alumni, and the International Organization consistently recruited a diverse and responsible group of fine young men and enjoyed measured achievement and success. In April of 2015 an opportunity presented itself to accelerate the growth and development of the chapter so as to allow Pi Lambda Phi to dominate the UF Greek system Academically, Athletically, Socially, and through Service --- IMMEDIATELY! This opportunity came in form of the brotherhood formerly known as ZBT. 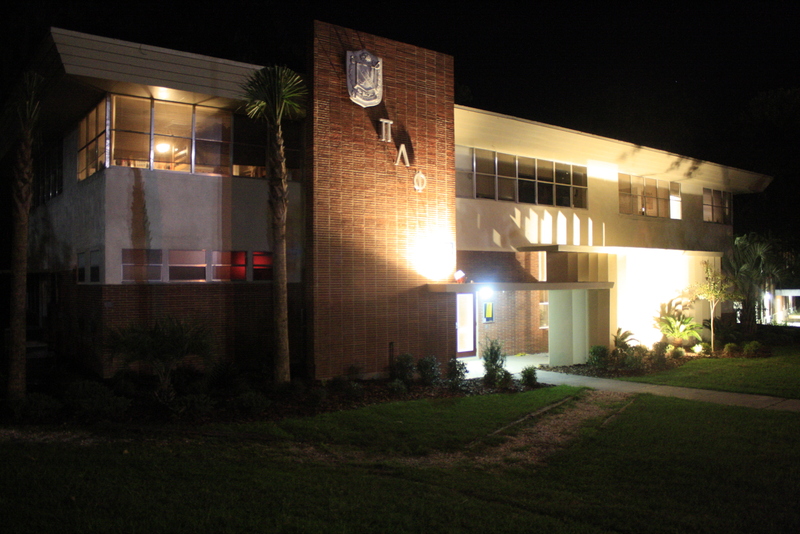 ZBT at the University of Florida was shut down in April 2015. Its leadership reached out to a relationship it had with a Pi Lambda Phi Alum from the 80s, and inquired as to the opportunity for them to join Pi Lambda Phi and continue their fraternal experience. Led by Jeff Buhler, Volunteer President of Pi Lambda Phi International, PC 90, former Rex, and Nosebowl Coach, an exhaustive process commenced beginning with the garnering of comfort with the events/non-events that lead to ZBT being shut down. Having crossed that bridge, the next step was to address the multi-faceted sensitivities of the groups with a stake in the future of these young men. With an alumni advisory board established, proactive communication began with UF Administration, Pi Lambda Phi International Headquarters, ZBT International Headquarters, Alumni from each of the past 6 decades, current Brothers of Pi Lam, Parents of current Pi Lams, and others listening to the pros, cons, risks and rewards of allowing the ZBTs to pursue joining the Pi Lambda Phi Brotherhood. Each voice was heard, listened to, and considered seriously. The voices were UNANIMOUS in the desire to move forward. Countless phone calls, emails, texts, lunches, dinners, small meetings, and large meetings ensued which ultimately lead to 108 brothers (roughly 2/3) of the former ZBT Chapter attempting to individually disaffiliate from ZBT and begin the process of consideration to join Pi Lambda Phi, again, individually. This was NOT an institutional merger. Each of the 108 former ZBTs were interviewed, in person, by a Pi Lam Alumni Advisory Board Member. These interviews were formal and scripted and took approximately 30 minutes each to complete. While a majority took place in Gainesville, they also took place in NYC, Atlanta, Dallas and Miami. At a vast majority of the interviews a current Pi Lam brother was present. What we found was a high achieving group of young men strongly resembling the Pi Lam Brotherhood of the 80s. Collectively they had won highest GPA on campus 9 straight years, they were dominant in several sports at the fraternity level, they were the envy of the service sector, and had broken through socially! What they did not have, as they were founded only in 1995 and their run of strength was less than a decade old, was a strong Alumni base of support. We were all, collectively, incredibly impressed and excited about the opportunity in front of us. 88 of the 108 young men interviewed received bids to join Pi Lambda Phi. 80 accepted and Fall 15 Alpha was born. They went through an expedited, 4 week, New Brother Education ("Pledging" Experience), and were initiated September 21st. This initiation takes the Brotherhood from 60 men to 140 men. The combined 140 Brothers of Pi Lambda Phi successfully recruited a new member class of 30 men strong representing Pi Lam Fall 15. The integration continues to be a Labor of Love. The HOUSE is in a place it hasn't been for decades. For those of you who have been there, you know exactly what we are talking about. For those of you who haven't, ask around or take a look at the pictures attached. Or better, as we will get to in a moment, get to NOSEBOWL 2015! Pi Lam is dominating athletically. With the End Spot/Option/Delgado offense of the 80s fully implemented, the Brother's Football team has won their first two games 28-0 and 33-0 - the second of those two scores came against the two time defending campus champs. We are undefeated in Tennis and in Volleyball. Socially, we are doing socials with sought after Sororities such as DG, ZTA, THETA, DDD, AOP, etc. Game Days are parties, the likes of which we have never seen. Alumni weekend - the Tennessee Game -- was a tremendous success, as in addition to all that is mentioned above, Alumni had the opportunity to meet, shake hands and engage with these brothers and pledges who looked us in the eye and had something to say! The Brotherhood holds leadership positions across IFC, Dance Marathon, Student Government, Blue Key, as well as several other organizations. Plain and Simple --- the House, OUR HOUSE, and the young men who embody the current Brotherhood and New Members is incredible! And we should ALL be incredibly proud to be associated with the Strongest Greek Organization on Campus! One word - NOSEBOWL!!! October 25, 2015! Be there! Pi Lambda Phi has not won by score in 10 years and has only won by score twice in the past 25 years. Through this quarter century a lot had been lost. That said, a lot is back, and we are confident that PC 15 will return Pi Lam to its winning ways. Alumni football legends who have watched, coached, and played against these guys wholeheartedly and sincerely agree - Fall 15 will win NOSEBOWL 2015 as Pi Lam Gentlemen AND by Score! The offensive system is back in place. We have more talent than we have had in years - think 1990. The coaching staff combines both legacy Pi Lams and PC Alphas (former ZBTs), AND Alumni have been actively involved almost every weekend with hands on coaching. All that said -- WE NEED YOUR SUPPORT!!! Don't cut your hair! Grow a Beard! PUT ON A SUIT! Show up for NOSEBOWL weekend and make a difference and further instill the tradition that makes Nosebowl and Pi Lambda Phi something so special to all of us! Your presence will make a HUGE difference to the day, the game, the brotherhood, and, most importantly, PC 15, and the momentum being built. 7:00 PM - Brothers vs. PC 15 - Controlled Light Scrimmage, Practice and Walk Through. It's going to be a very special occasion and a momentous breakthrough/return to glory for Pi Lambda Phi! Be there, bring a friend, bring your family, and remember - Wear a suit/jacket and tie! Not Four Years, But a Lifetime!